As a Valentine’s Day splurge, I decided to make a booking at LuMi. But that was only because I was a novice at the Valentine’s Day restaurant game. 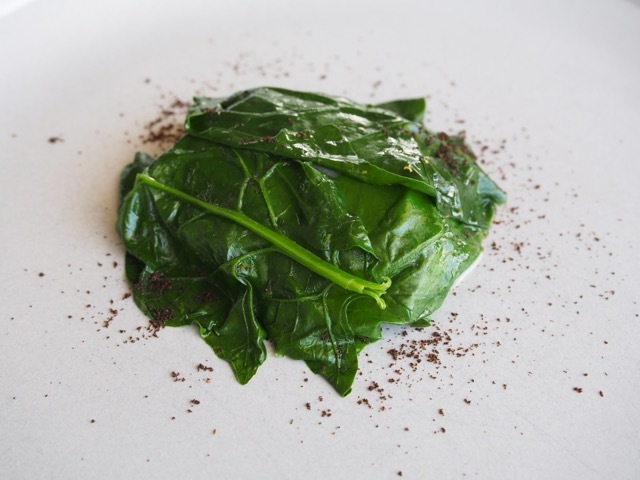 I quickly realised that bookings for Valentine’s Day are scarce, and if you do find an opening, there is a ‘special’ Valentine’s Day fixed menu, which is way more expensive than the regular menu. It was enough to make me forgo the whole thing. 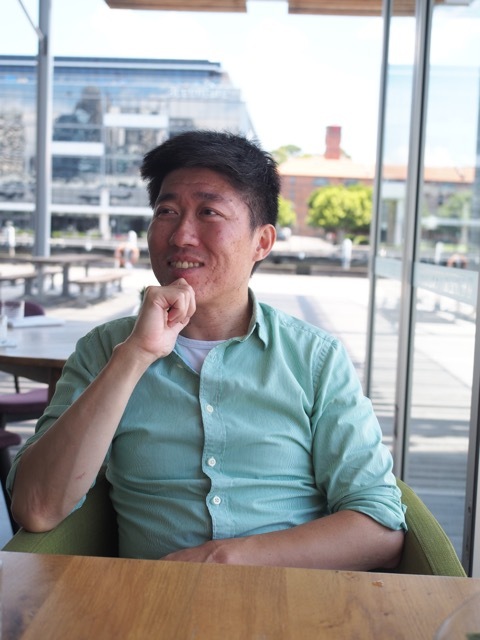 Luckily things settle down the day after, so I made my booking for post Valentine’s Day to sample LuMi’s famous 8-course degustation menu ($95) for lunch. The other advantage in dining out the day after Valentine’s Day? You can just about have the place to yourselves. 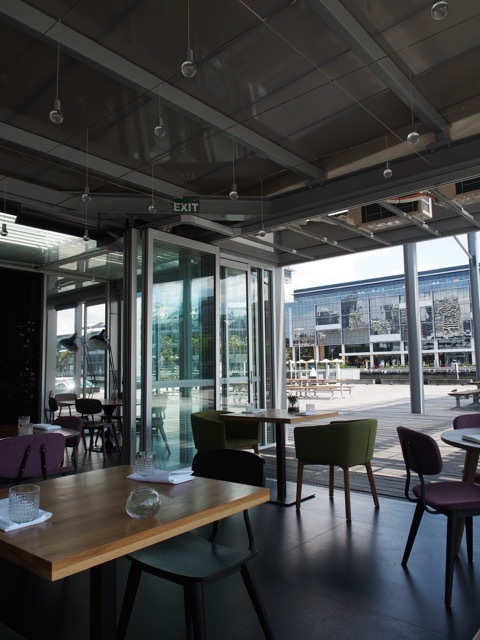 As you enter the open restaurant, the exacting service from the engaging wait staff makes you feel welcomed and relaxed. The first course was a range of amuse-bouchés. 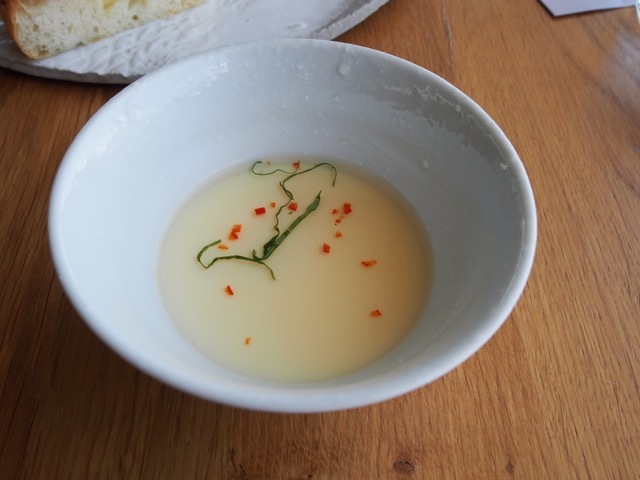 We started with a silky chawanmushi delicately flavoured with tomato water. 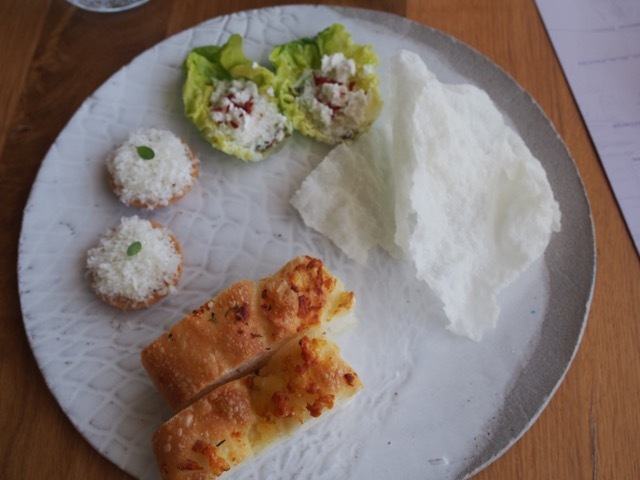 Then, there was a tissue-paper thin salt and vinegar-seasoned rice wafers, cos lettuce leaves topped with pistachio miso, miniature tartlets with cheese and corn, topped with feathery shavings of parmesan, and to round off the plate, potato and rosemary focaccia. It seemed like a lot of food, and we were only at the first course. 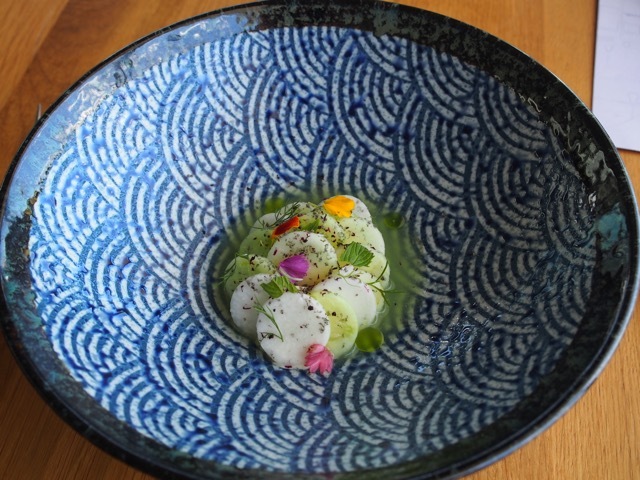 The second course was simply called ‘white cucumber’. 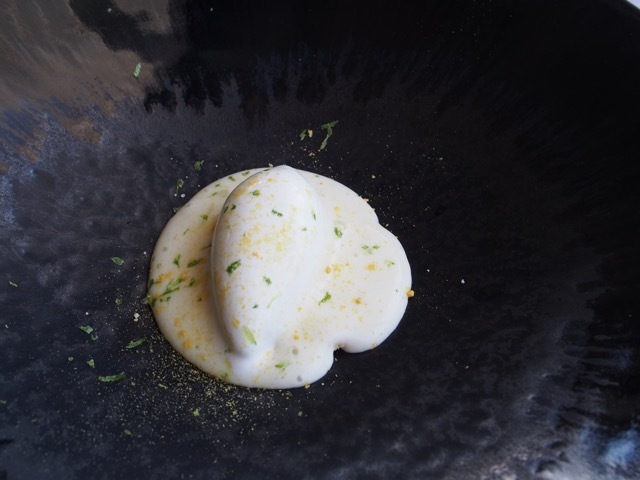 This was of cucumber and crisp apple medallions sandwiched with sour cream in a fragrant soup. Very refreshing. 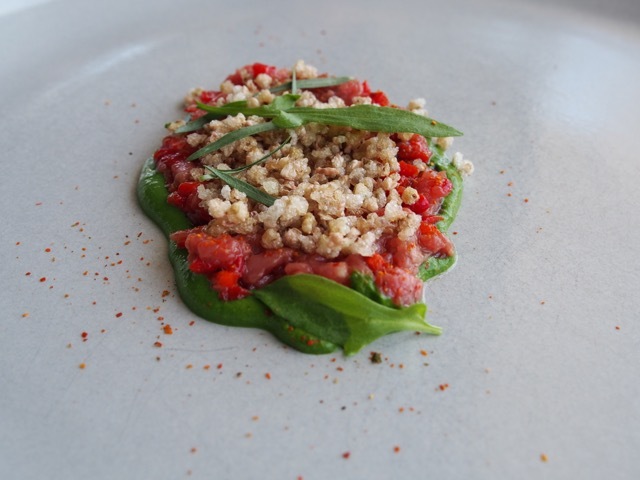 Next was the veal tartare served on a tarragon emulsion with roasted capsicum and puffed buckwheat. Our favourite course was the spelt ravioli with burnt butter and pumpkin filling. We were advised to put the entire ravioli in our mouth to experience the flavours. The combination was fantastic, the warm burnt butter complemented the pumpkin puree beautifully and the spelt pasta was a great foil for the creamy textures. 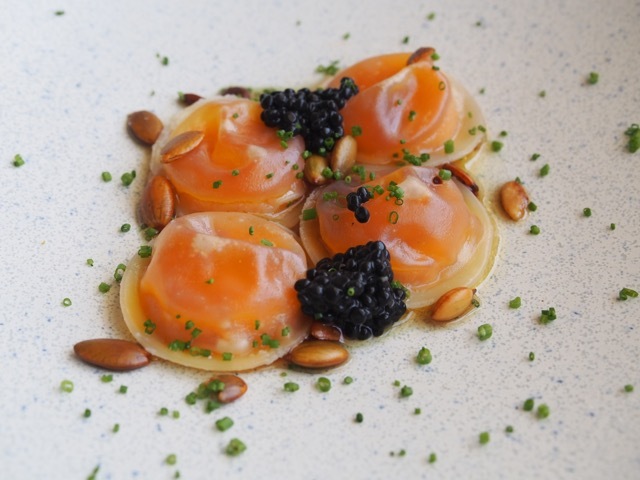 The dish was served with avruga caviar and toasted pumpkin seeds. Sublime. 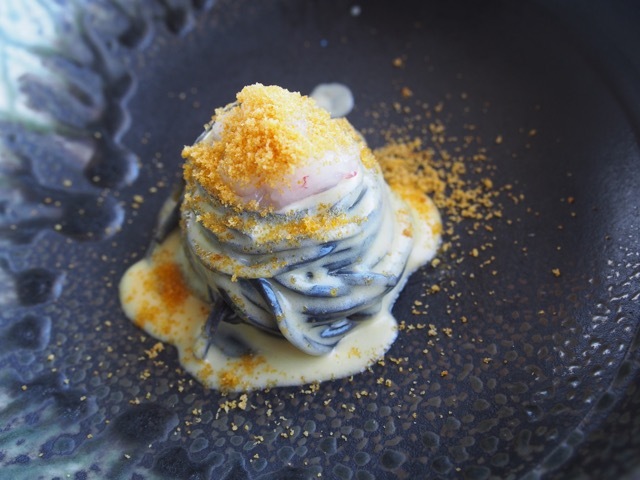 The next course was another pasta dish, – spaghetti alla chitarra which was served with orange buerre blanc sauce, scampi and bottarga (cured fish roe). This was nice, but two butter based pasta dishes was too heavy for me. 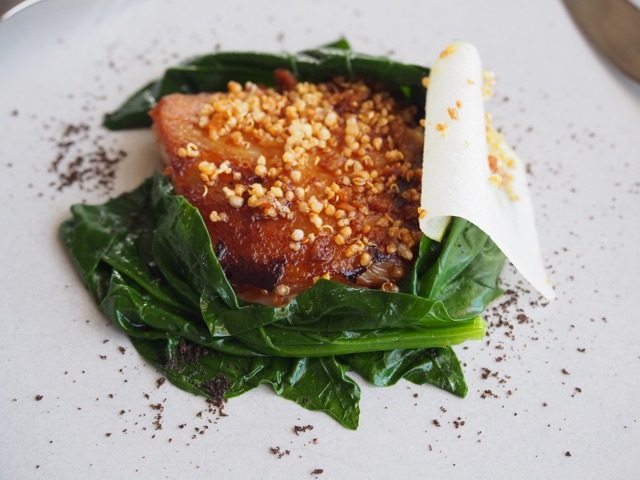 The quinoa topped pork jowl was covered in a blanket of blanched spinach leaves, and sat on a celeriac puree. This was tender, perfectly seasoned, and lovely. I was looking forward to the palate cleanser. Called ‘evergreen’, it looked almost too pretty to eat. 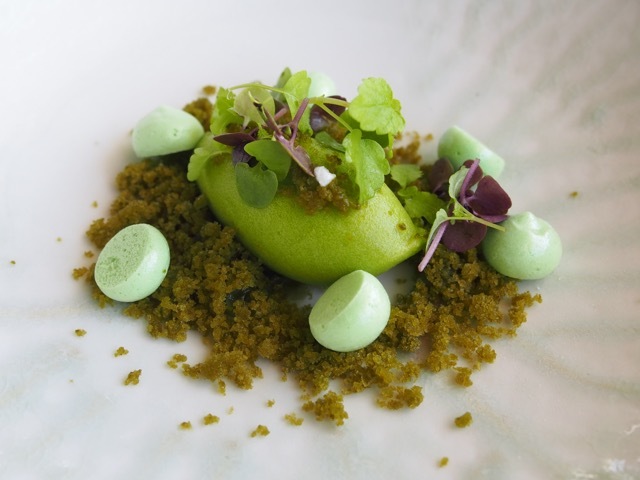 It was herbal and very refreshing, with sorrel sorbet, lemon basil granite with little mint meringues and shiso jelly. I really enjoyed this. The last course was nicely nuanced ginger and white chocolate ice-cream, which was enveloped with yoghurt crumble with a hint of passionfruit. 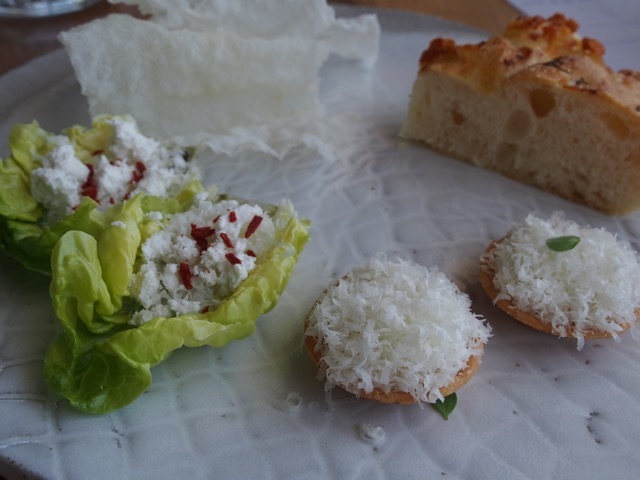 This was such a treat – elegant, clever food in a beautiful setting with attentive and friendly table service. 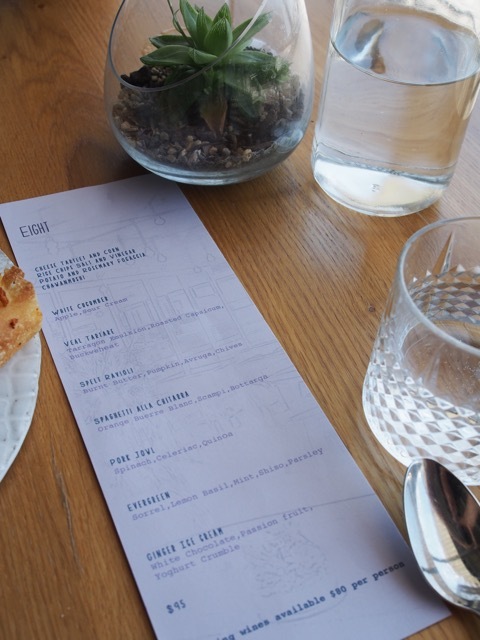 LuMi’s degustation is excellent value, and a very special treat.